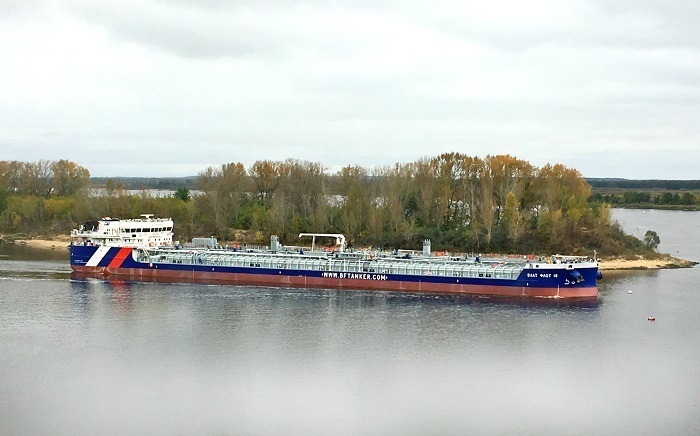 Nizhny Novgorod, Russia based shipyard Krasnoye Sormovo (United Shipbuilding Corporation) says it has delivered the chemical carrier of Project RST27М, Balt Flot 16, to BF Tanker. The shipbuilder says the vessel will be registered at Big Port St. Petersburg. It is the first ship in a series of five chemical carriers of Project RST27M to be built by Krasnoye Sormovo in 2017-2018 for BF Tanker with State Transport Leasing Company as the customer. The three-party contract was signed in late 2016. According to the statement, Balt Flot 17, the second tanker in the series, has completed sea trials. It is to be delivered to the customer this year as well. RST27M ships are under construction for the first time in Russia. Improved chemical carriers with a capacity increased by 800 t (as compared with RST27 ships) will be able to transport crude oil, oil products and noxious liquid substances in six cargo tanks (with simultaneous carriage of three types of cargo). The tanker design takes into account special requirements of Russian and international oil companies as well as additional environmental restrictions of Russian Maritime Register of Shipping «ECO PROJECT» (ECO-S). The vessels are designed for mixed (river-sea) navigation. Main particulars of Project RST27M: LOA: 140.8 m, breadth: 16.9 m, DWT in fresh water (draft 3.6 m): 5,337 tonnes, DWT in salt water (draft 4.6 m): 7,875 tonnes. The vessel was designed by Marine Engineering Bureau to RS class: КМ Ice1 1 R2 AUT1-ICS OMBO VCS ECO-S Oil tanker/Chemical tanker type 2 (ESP). Detailed design was provided by Nizhny Novgorod based engineering firm Volga-Caspian Design Bureau. MNP Group (Marine Oil & Gas Projects) is the Company Manager of shipbuilding projects. With its extensive experience in civil shipbuilding MNP Group ensures efficient response to market changes, comprehensive use of its resources and accurate compliance with deadlines under shipbuilding contracts.